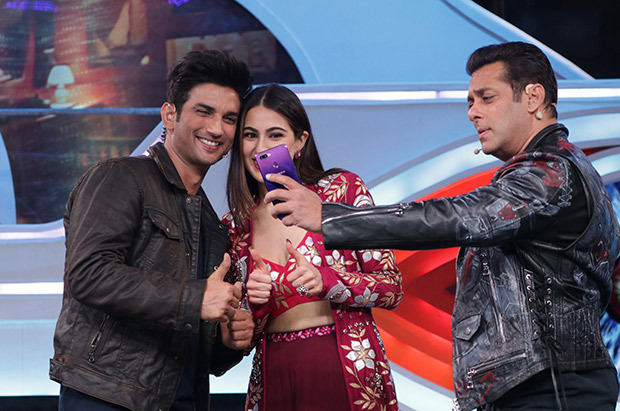 Salman Khan‘s Weekend Ka Vaar episode saw Sushant Singh Rajput and Sara Ali Khan grace the show and play some fun games with the inmates as they promoted their movie on the show. Sara had especially good time with Salman who also happens to be her Saif Ali Khan‘s very very good friend! Sara played fun games with Salman and co-star Sushant Singh Rajput and even entered the house. All was going good, she even got a warm welcome by the inmates until they started to do a task. Well, in one of the task introduced by Bigg Boss while the Kedarnath Jodi was in, an inmate had to be tied to a wheel and other housemates had to bomb that person with water balloons. Romil was asked to go on wheel and so for his safety, Sara asked him to wear glasses to which he rudely replied that he is better off without the same. Later, she even requested him to join everyone for a dance and he rudely refused. All inmates got confused as they did not understand why he would do this. It was expected that either Jasleen Matharu, Megha Dhade or Deepak Kumar would get eliminated but Salman declared that there were going to be no elimination this week. The votes would be carried forward next week instead. Meanwhile, Sara has been running pillar to post promoting her movie Kedarnath. She seems to be the only newcomer who has back to back releases in one month! She is making most of this opportunity and is visibly excited for the film. The trailer of the movie is impressive and people are loving Sara in her interviews. She is being appreciated a lot for her candour and fun loving persona.